Today is turning out to be quite exciting and satisfying! Not only is the sun shining, but a project that we have been working on for over 2 years to create what we have fondly called "the twirly lecture theatre"is about to be completed. As styles of teaching and delivery change, we are being required to create a wider range of spaces to accommodate the changing needs of staff and students. We still need the traditional lecture theatres, classrooms and seminar rooms, and I can't see that changing in the foreseeable future at my own institution, so we also need to create new spaces that are adaptable and agile to users requirements. A few years ago, we created an experimental "Active Learning Classroom". We took an old, 100 seat raked lecture theatre and turned it into a multi-level group working space for 40. Although we flooded it with technology, we were careful not to install anything fixed within the room in case we had to make rapid changes. This space is a fantastic teaching and learning venue, and we, the designers, managers and supporters of the space have also learned much to inform the development of future innovative spaces. One of the problems with teaching is that you may want different types of spaces at different times throughout the delivery of your module, and to accommodate this in an 11 week period in the timetable, it may be necessary to book out two rooms in order to switch between both during the term. This is wasteful, but we know that it happens. The project we are now completing is the creation of an "interactive lecture theatre", a space where a teacher can deliver traditional teaching if appropriate, but can also have students working in defined groups all facing one another. Chairs that turn around have been around for years I know, but we wanted to do more than provide chairs with writing tablets, we wanted to create defined group working areas. The major problem with this has been the movable seating, seating that not only turns around so you can face the students behind, but also allows you to reach the writing/work surface. The room accommodates 12 groups of 8. 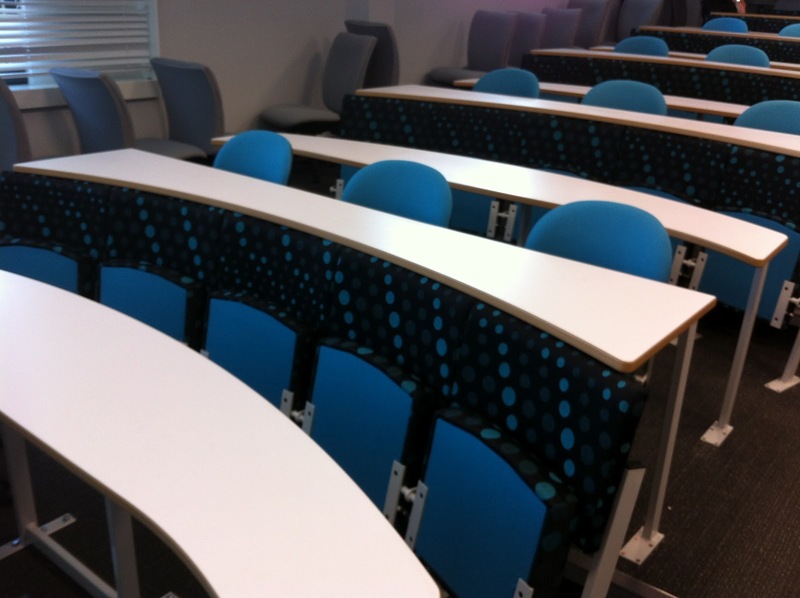 The fixed row consists of 5 seats curved in to improve group working (an idea borrowed from one of the lecture theatres at the University of Strathclyde) and the twirly seats are arranged in rows of 3 to give them both space to turn and also mesh with the group behind to avoid clashes with books etc. The refurbishment of the room was actually completed last September, but the twirly seats had not arrived so we used operators chairs temporarily until the correct seating arrived. you can see them at the side of the room. Feedback from staff and students has been very good notwithstanding the fact that the room wasn't complete, so we will be undertaking more formal evaluation of the room and facilities soon. Toni this is of interest to me as I am designing a similar if not identical setup. One question I have is about the group dynamics. I have always been led to believe that 5 or 6 is probably the optimum size of an effective group. Was the group size of 8 driven by the available space, which would be understandable. Also do you think the people on the ends of the group of 5 will be able to communicate effectively? I am sure you will agree that most if not all learning environment designs are compromises in one way or another but I wondered what the main drivers were on this project and what was proposed prior to the final decision? I hope you are over the jet lag by now and starting to enjoy yourself. When we built our active learning classroom, we were under pressure not to reduce the capacity too much, but even so we went from 118 seats to 40. The 40 is made up of 5 groups of 8. This grouping came about as a result of some Engineering lecturers who had some groups of 80 which they were prepared to split into two groups but no more. The room has been in use for 3 years now and to date we have had no complaints about the groups to be accommodated, rather that we could do with more facilities like this. Again with the twirly LT we created a 96 seat LT out of 2 rooms, one with a capacity of 94 and the other with a capacity of 46. although timetabling were willing to lose the 46 seat room, they needed to maintain the 94 capacity facility. The seating has been carefully designed over a period of 2.5 years using templates to guide us in terms of space per person and how the students on the periphery will interact with the main group. 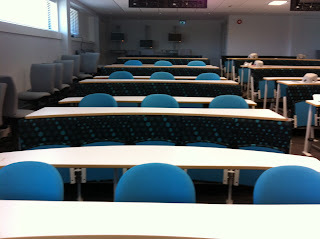 For the curved seating, to bring the students at the end of the row back into the group, we took our inspiration from classrooms built at the University of Strathclyde which we visited for a SCHOMS Conference and as part of the JISC funded study on the impact of technology on learning spaces which was the basis for the JISC publication Designing Spaces for Effective Learning. Strathclyde was one of the 15 cases studies used to demonstrate innovation and good practice in the area and in particular their classrooms which used curved seating to encourage interaction. They set up a range of classrooms with groups of 4, 6 & 8 all in a curved bank of seating, but seated in the same direction. What we have done is taken this tested method, changed it slightly and added the ability for student in front to turn around. The main drivers were to provide new spaces that could accommodate both traditional teaching and group work without any intervention on the teacher's part (resetting furniture etc.) and also providing new spaces that were not challenging to the novice and would encourage experimentation. We have lots of rooms with the Melbourne inspired plectrum tables for six which are very well liked by our staff and students, so much so, that individual schools are using the plectrums in their school projects, so I think being able to accommodate other groups that are slightly larger for practical reasons only adds to the wealth of the overall stock of spaces. Nope, up at 4am, will be asleep by 6pm!!! It is intersting that the curve brings the outriders back into the group but thinking about it I can see this would help. If they were in a straight line I doubt it would work as a group. I am still unsure about the group size mainly because some of my educationalist collegues say 6 is optimum. Of course they do not suggest that 8 does not work and if it allows more capacity then it is sensible to use 8. As I said earlier, design is often a matter of compromise. This room has been a challenge not only in terms of design but also for the furniture manufacturers (we have had to use 2) who have never been involved in anything like this before. Now that it is finally complete, we will be undertaking some thorough evaluation, and the question as to how the room works and the impact of the group size set up against the actual usage of the room will be established.